Take a look at our full range of fabrics here. We hope this guide will help you think through the selection process and feel confident in your decision. Natural light - In or out? If you want to block out the light, try a heavier fabric with a tight weave or a blackout curtain fabric. You can even back a lighter fabric with a blackout fabric if light blocking is your top priority. If you enjoy natural light in your room and want to filter it, try an open weave or a sheer fabric. A heavier weight fabric with a tighter weave will be better at keeping the cold out than a sheer or open weave fabric. Hemp fabrics are great natural insulators, keeping the room cool in summer and warm in winter. INCU chose 100% raw hemp fabrics like Warialda & Gin Gin as their change-room curtains & banquette covers. Incu is found in The Galeries Victoria in Sydney, Australia. Hemp fabrics are naturally UV resistant. Curtains can see a lot of sunlight streaming through the windows. This isn’t an issue in every window, so you’ll want to think about your home, which direction the windows face and how much natural light they let in, and decide if this is a concern for you. In general, south-facing windows will see the most sunlight during the day. We suggest adding a lining to the back of the fabric to protect the decorative fabric itself from UV rays. Curtain lining is also great for making fabrics a little more opaque and for adding more body for fuller looking drapes. Before you even start measuring the window, you need to make some design decisions about what type of window treatment you’d like for your window. Do you want short curtains or long drapes? Will they hang from a rod mounted inside the window frame, or above the window frame? Once you have a good mental image or maybe a sketch of what you want your curtains to look like you are ready to start. Using a metal retractable tape measure (not a fabric measuring tape) measure the width of your window. For an inside mount, measure across the glass. With an outside mount setup measure from one outer edge of the window molding to the other. Write down your total measurement. 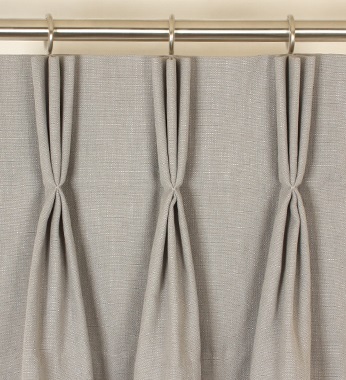 To add fullness to the drapes or curtains when they are closed, you’ll need to account for extra fabric. To do this, you’ll need to multiply the total width by a fullness factor of anywhere between 1.5-3. If you want a flatter curtain, you would multiply the total width by 1.5 or if you want a generous fullness, opt for the higher multiplier of 3. Measure the height of the window from where you want the curtains to start at the top and where you want them to fall at the bottom. Curtains generally stop at one of a few points: at the windowsill, at the bottom of the trim, 3cm above the floor, or they will puddle on the floor. Drapes that puddle give a dramatic effect and have a very formal feel. Add an extra 15-30cm to the measurement at the floor for this look. A window treatment starts at its rod. Curtain rods typically sit about 10cm above the window. However, you can hang them closer to the window as long as you leave enough space for the brackets. A popular choice is to hang curtains high and close to the ceiling. This trick helps to elongate the look of your walls and make the room feel taller and more spacious. When you have your total height measured, add 20-25cm total for hems. If you are using clips or rings to attach your curtain, you’ll want to measure that hardware. Then subtract the length of the hardware from the curtain height. This ensures that your curtains fall at exactly your desired location. With your measurements calculated, all you have to do is order your fabric and get sewing! The fabric calculator below makes it easy to figure out how much fabric to order. Enter in your measurements in centimeters and it will calculate the required length of fabric. Please note: these calculations are approximate - we recommend that you over-estimate your measurements to ensure you have enough material for your desired heading type & tie-backs. This calculator is not to be used for the lining or backing. Your lining is normally 0.5m less than the front facing fabric. This is the length from the pole / track to the ground. Depending on your desired heading type, the amount of fabric that is required will be multiplied by a specific fullness ratio. See the table below. If you would like to see our full range of fabrics, click here. If you require extra long, extra short, extra wide, extra full or cant find what you are looking for custom made hemp curtains may be a solution for you. You will pay a bit more for your curtains than the standard ready made ones. Why Buy Custom Hemp Curtains? Our hemp custom made curtains are made to your exact window and track widths so there is continuity on each window. After payment has been received we will confirm with you via phone or email regarding the measurements to confirm before starting on the project. Your curtains will be delivered to your door within 14-21 days. Where was this hemp grown? Our Hemp is grown in Greenland and made into yarn. Where was this fabric made? The yarn is sent to China and weaved into fabric.